What happened to the sun? The whole day has just been gloomy, cold and wet. I never expected this kind of weather during the summer. The kids and I were suppose to go on a walk to the dollar store with a side trip to my Walgreens, I'm not about to forget about that. The day started out sunny but it got gloomy quickly and it stayed like that the rst of the day. I don't know when the kids will be back in the pool. I'm positive the water temp has gone down drastically. At least the kids have their tablet, IPhone or the Wii to occupy them. As much as I hate them playing with it the whole day, it is a great babysitter. Keeps the kids occupy. I do give time limits on how long they can play with electronics. But, when I am to busy doing things around the house I just let them be. It's easier for everyone. I just want the sun and the warm weather to come back. I want it back in full force before Autumn heads her way into our part of the world. I have just received bad news from home (Philippines). It seems that my grandmother "Lola", is ailing. There is no denying that my grandma is getting old. She misses my grandfather who passed away a year ago. They were each others bestfriend. I was told by my mom that Lola is getting weaker, she has lost a lot of weight and nobody is really taking care of her. You see, my grandma was the most caring, kind, generous and thoughtful person when she was still healthy. Now, she is becoming a shell of her former self. In my mind I can't seem to process my grief. I know in my heart I'm devastated by the news but I feel numb. I am in denial, I refuse to believe it. Therefor,I don't talk about it. I can't do that to my grandma. How I wish I could go home and take care of her before she passes away. My taking care of her will not even begin to pay for everything she has given me and my family. I miss her, I want to talk to her. I am a coward, I'm to afraid of my emotions. I miss her. If and when I do get a chance to see her again, I will beg for her forgiveness because I have forgotten her. I need to do my part in helping her out. If I cannot be there physically at least I can try and help monetarily. It won't be much but it is from the heart. I will be totally crushed if something happens to her. Not yet, I am not ready to loose her. Please Lord, watch over her. My oh my, it certainly has been awhile since my last update. I did write several times over the months but, I keep forgetting about it. I have attempted to update several times but something always comes up. I'm usually at my daughters gymnastic place when I start writing. I just keep forgetting on publishing my post. The kids are finally out of school,no more waking up early, no more walking to the bus stop and no more driving my youngest to Pre-K school. The weather has been kind of iffy. One minute it's warm as an oven and the next tis freezing cold. I have been getting sick due to the weather. And it doesn't help that my spring allergies was at its worst. There was a day that I was just so sick that I was light headed all day. Good thing I have an understanding husband. He took care of the kids and just let me rest and sleep. That happened several times, usually when the temperature drops. My spring allergy has finally died down and I can now breathe thru my nose,lol. Right now, I'm sitting on the couch and watching my daughter play just dance on the Wii. She is so funny and she knows almost all the move. But, it doesn't mean that she is executing it properly,hahahaha. She is such a piece of work,definitely one of a kind. Today, my hubby took me driving for the very first time. Hubby doesn't want to teach me. According to him " Hun, if I teach you'll end up divorcing me and I don't want that". Does that mean I'm so bad? I felt crappy waking up today. Hubby has been feeling under the weather and I think I caught something from him. I took an alka seltzer night tablet and it knocked me out. I'm a pretty light sleeper but I didn't hear my husband came in. The next thing I knew he was In the room changing,I would wake up and as soon as I'd blink I was off to la la land. It was probably the best sleep I has since moving back in the masters bedroom. But anyways, I still woke up crappy. Felt like my eyes were swollen,had a throbbing headache. Still I made up my mind to get dress and go for that driving lesson he was going to teach me. We also planned a date just the two of us. We went to the city where there was a big parking lot with plenty of surrounding stores. It was very deserted since it was a weekend. I thought I was doing pretty good until I heard the sounds coming out from hubby. Many times he got so close to yelling at me but stopped himself. To cut the long story short, I did bad. I killed several imaginary pedestrian, swiped a dozen imaginary parked cars and crashed into imaginary oncoming traffic. 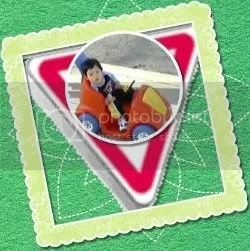 One thing for sure,he is enrolling me to a driving school once we eat our tax money. With a more and more practice, confidence i know I'll eventually learn how to drive. 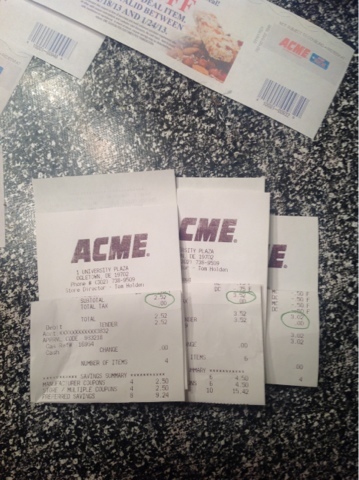 I totally forgot to post about my trip to our local Acme. My children eat a lot of cereal, waffle or pancakes for breakfast. My stockpile of cereal had reached its lowest point, not one cereal left. When I heard about the great deal on cereal at any Acme supermarket I just had to make a trip. This was 1/7/13 and I did. 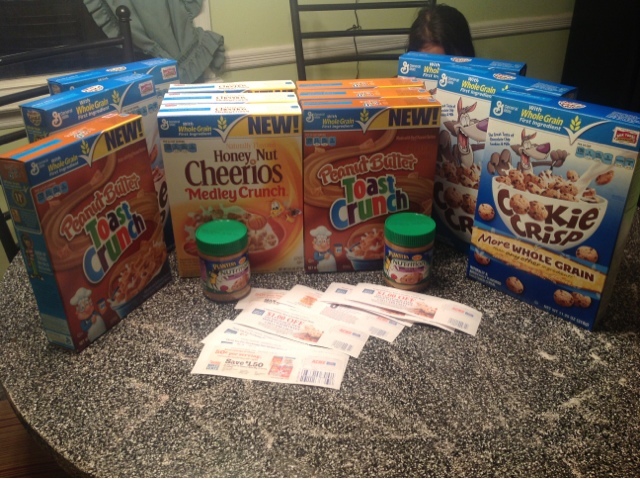 3 different transaction and paid a total of $9.06 for 12 box of cereal and 2 small jars of peanut butter. I was going to break it down but I can't seem to find my receipt. Next time I will be sure to break it down for you as well as the coupons I used. Produce : great time to buy, citrus fruit full of vitamin c,broccoli, avocado, cabbage, cauliflower, pears, kiwi,grapefruits, carrots, cabbage and celery. Keep your eyes peeled on your local supermarket circulars and stock up on them when they go on sale. It's been 2 weeks since the girls have been sleeping by themselves and I am back in the masters bedroom. My husband and I did not have a falling out, I just prefer to sleep with my kids than with him. I sleep better knowing that I am in the same room with them and they sleep better knowing I'm with them. My family loves co- sleeping, if my husband didn't work we would all be sleeping in the masters bedroom. It was a hard decision for me not to sleep with my kids, specially the youngest. For 5 years I have been sleeping with her. I have to get use to sleeping with my husband all over again and his the same way. Being a light sleeper I am constantly woken up by my husbands twitching, tossing and turning. Haven't gotten any quality sleep since I moved back in. On the other hand, my kids are sleeping in their own room by themselves now. I am so proud of them. I still miss sleeping with my youngest. Did I do the right thing? When they reach puberty I am positive they will no longer want to sleep or snuggle with me anymore,I hope that won't be the case. I don't regret co sleeping with my babies and I would do it all over again. I am absolutely relieved that we finally got our garbage out just in time. We missed 2 weeks worth of garbage being picked up and it was accumulating.. I was more worried about my recycling as i still have a whole bunch of trash that needs to be recycled. Caring for our environment has to start small, within the household. My kids know the importance of recycling. As a couponeer, I use a lot of printing paper to print coupons. Most often that naught, not all coupons will be used. Wasting any more paper is out of the question. So I took all those papers with expired coupons, clipped them together and gave it to the kids for them to write , draw and use for craft. Eco friendly printing is popular nowadays due to the fact that they are safe for the environment. We are also assured of products that have gone thru the 3 R's that is Reduce, Reuse and Recycle. 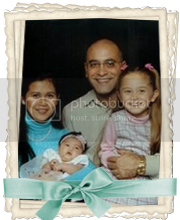 Patronizing products from Eco friendly printing assures you that its safe for the environment and your family. With how our environment is today it is of vital importance that we value and take care of mother nature. And one way of doing that is starting slowly but sure and teaching the young generations of today the 3 R's = reduce, reuse and recycle. We have started that in our household, how about yours? Weekends are usually lazy days for all of us.. That means sleeping in past 9 am and staying in our pj's all day long. We did go to a couple of stores to get some much needed supplies like my rice but other than that we just stayed home. The kids were busy playing with each other, fight broke out here and there. And of course Mama is the referee and judge. While kids were busy playing I was surfing online and browsing through other people post on FB. I also frequent my favorite site hoping to catch great deals from food, clothing, toys, household items, accessories and many more. As it happens there was a good deal for sterling silver jewelry just what my sister likes. I wasn't able to take advantage of it but I know something will come up again. My sister is graduating from her culinary course in June. It would make a great gift for her. Well, I still have a few months left so have plenty of time to decide what her graduation present will be. According to Wikipedia = Pomelo or Citrus maxima or citrus grandis - is a crisp citrus fruit native of South and South East Asia. 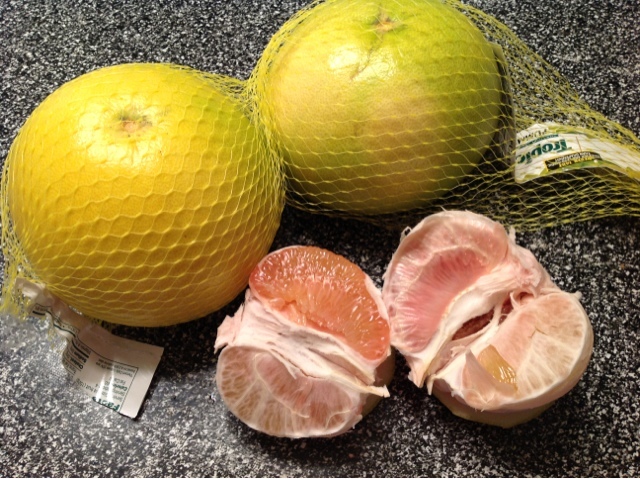 I have so many fond memories of the pomelo fruit growing up. My maternal grandparents used to take us to the our rice farm. Grandma made it point to plant a lot of fruits. It was always a treat for us when we go to the farm. We had our fill of many kids of fruits. Mangoes, chicos, tambis, pomelo, tangerines, coconut and many more to mention. My cousins nanny would make phones out of the pomelo rinds. The pomelo is always eaten with salt or vinegar with salt. I prefer vinegar and salt when eating the pomelo. I cannot have enough of the fruit. I used to relish my portion of pomelo but eating it one pulp at a time. When I saw the fruit at BJ's today I had to buy it. It is expensive but, I get to splurge sometimes and I love to splurge on food.. Have you tired one? It feel like it was just a couple of days ago that we were gearing up the the New Year. And now were are approaching the middle of January. Before we know it well be preparing for Christmas. Now that New Year is out of the way I can focus and plan on my upcoming vacation to my homeland,the Philippines. I am not just excited about going home but also to be art of my cousins upcoming nuptial. We grew up together and are like two peas in pod. Her nuptial is much awaited as its been a long time coming. As her cousin and partner in crime, I am happy that she has finally found the man of her dreams and settle down. We have been in contact and talk about her upcoming wedding constantly. Weddings are not easy to plan as I thought. If you don't have a clue in where and how to start planning one, then you are in big trouble. Luckily, that is where a wedding planner comes into play. My cousin works as a flight attendant and is based in another country. It's specially hard on her. An older cousin and I are doing our part in helping her with anything she wants. However, I have forgotten to ask her about her wedding favors. Knowing her, she is bound to choose a unique wedding favors that will be memorable and fun. It will be something that will truly showcase the love that they both share. Unique wedding favors doesn't have to be expensive, the important thing is how it will represent both the groom and bride. To share with their guest their love for each other. I cannot wait to find out what they have chosen. I have a few ideas myself but I'll leave it all up to her for now. Today I did a little side trip to my fav store,Walgreens. I got a free children's fish oil vitamins and Cracker Jack. The store manager happened to be by the counter when I came in. He know me by name. I asked if I could have next weeks ad, he then told me that he has a lot of the pure leaf drink on stock as it was going to be free starting 1/13. I was so happy to learn about this. I don't have to worry about clearing shelves. He knows that when their is a good freebie like beverage we take advantage of it. But, we do tell them before hand how much we're thinking of purchasing so they can order it for us. He assured me that he has more than enough to go around for other customers. That made my day. Once I got the ad in my hand I went about to check my store if they have it and how much they have. So far, I have only seen 1 freebie product after RR the rest I assume are still in the crates. They were still busy refilling shelves with new stock. For sure I will be stopping by again, the cashier forgot to give me my RR when I bought the vitamins and the Cracker Jack. My RR's were already set aside for me to pick them up. It's good to know your store and the people. I consider them family. My husband is not having a good day so far. He got little sleep last night, he was always up and restless. I was lucky I didn't get hit while he was tossing and turning in bed,lol. He is not feeling well, might be getting the early stages of the flu. Hopefully it's just a cold and not the flu. When he got to work someone back into the front of our Jeep.it was just minimal damage with Theron lights cracked and the front bumper paint chipped. The important thing is, he was not hurt. I feel so bad for my husband. He is a good provider and thinks about us all the time. I feel guilty being a stay at home mom sometimes, specially on those days he is so tired. The next school year I hope to be working and driving as well,lol. Two income should lighten the load that my husband is carrying right now. If things go as we plan we should be breathing easy by the end of this new year. With today's economy on the brink of recession, each one of us find many ways to save on our daily expenses. As a family of 4 depending on a single income,every saving is appreciated. As a stay at home mom, I vowed to find a way to help my husband maximize the value of a single dollar. That was a year ago last October that I consciously decided I wanted to use coupon to maximize my savings. Mind you, couponing is hard work, takes organization, skill, persistence and patience and a good understanding of each stores coupon policy. I did it by trial and error. I used spurned and look down on people who use coupon. Little did I know those people that use coupon are smarter than me. Ever since I started clipping coupons, we have saved hundreds on our grocery and household needs. Coupons is not only limited to grocery stores, drugstores like Walgreens, RiteAid or CVS. Most company nowadays use coupon to entice new customers and keep regular customers loyal. Coupons can be found anywhere and with the convenience of the World Wide Web we don't even have to leave the comfort of our own home to shop. If you like to shop online and love more savings on sale items? Stack up on online codes that you can redeem. Hundreds of stores have coupon codes out on a daily basis. One place where you can find tons of codes is the is Coupon Chief coupon codes, where hundreds of codes are regularly available and updated for people like you and me to use. I have visited so many coupon sites but, this takes the cake. Stores are in alphabetical order so you won't have any trouble finding a certain code for store. Famous stores like, Victoria Secret, Bath and Body Works, Forever XXI, Coach, Best Buy to name a few. You want a coupon code, they have it. So if you are in a mood to shop and maximize savings, be sure to check out the coupon chief. I for one will be sharing this with my coupon buddy as she loves to shop online. And with the Semi-annual sales going on, I might snag more for less buck.